Probably because it’s Year of the Tiger, this has been a Durga year for me. I’ve been living with her image from the start, her picture on the front of my notebook and in front of my eyes every time I take it out to scribble an idea, take some more notes. Year of the Tiger is my year, anyway. Born in January 1963, I got in at the tail-end J of Year of the Tiger 1962. And naturally, I have a tiger-thing, have long dreamed of visiting Ranthambore or some other tiger park in India before my demise. And that there was a tiger painted on the backdrop of the 7-day long Immersion and workshops with John Friend in SF in February, helped seal the image in. 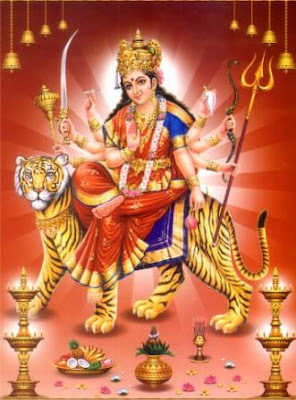 But more than just the tiger, it really has been about Durga all year for me. Every time I saw her now-peeling image on my notebook, she reminded me to wield all those weapons in defense of what’s true and right, for me. I thought about the work of cutting what’s unnecessary, mustered the ferocity to stay on track. And believe me, you need all those arms and all those weapons. I’m still reflecting on everything that happened this year. Durga served me well. I am really grateful, humbled and happy and satisfied with how much everything has evolved in one year. And aware of how much work it was to maintain that degree of sustained focus. And since we’re here, at the end of 2010, it’s time for 2011 notebook and 2011 goals. Which means pretty soon Durga and the red Moleskin notebook she adorns will be heading into the cabinet soon to sleep with 2009 and prior yeas. Thanks to this year’s experience, I realize that the work of setting a course for the year gets bigger every year. It used to be coming up with New Year's resolutions. Then it became for me a list of goals, in discrete categories, 'cause that's how my mind works. Then, thanks to yoga, I added in the creation of a sutra for the coming year, a word or phrase or couple of lines, to help keep on course, a distillation, concentration of the idea of the year. And now I see that there's another level, too. There's the image, the visual to help keep me on track, to provide a non-verbal heads-up every single day. So excited to dream about 2011, to consider where I want this path to take me over the coming 12 months. Year of the Rabbit, here we come!